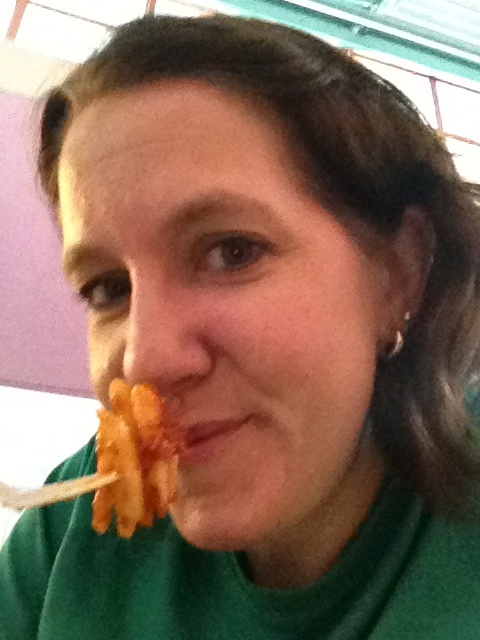 When I was given the opportunity to try out pasta dishes, I was beyond excited! I often tell people that ask me why I run “so I can eat all the pasta I want”. I LOVE pasta. Me, enjoying the Tomato Basil Penne Pasta Barilla in 60! 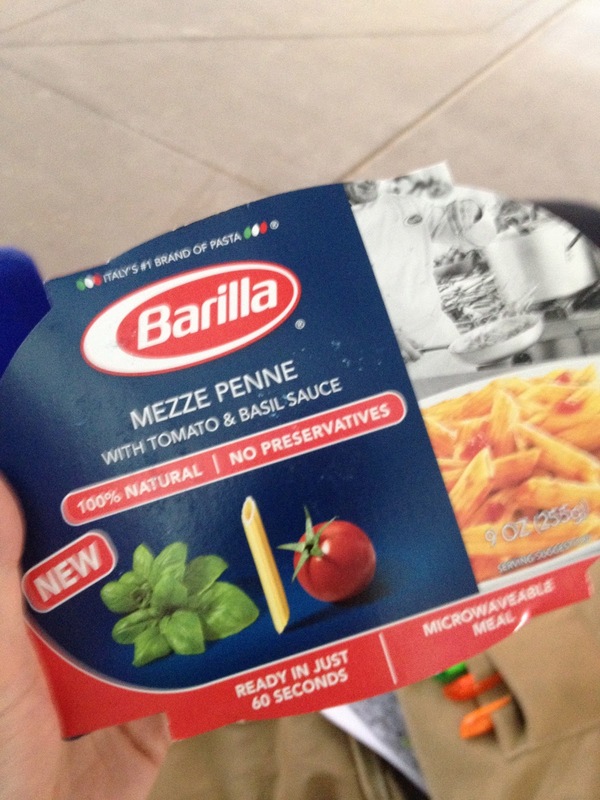 Barilla introduced microwaveable pasta dishes that cook in 60 seconds. I’ve cooked them in 2 different microwaves, and that held true. The meals are all under 350 calories, so they won’t destroy a calorie budget for those watching what they eat. If you want a more complete meal, they are easily “dressed up” I have added a side salad and cheese, or even a piece of chicken or chicken sausage. But, on their own, they are great. To say my life is busy, is an understatement. I work full time, just bought a house, go to school part time, work out, and volunteer regularly. With my work, I am not always in my office at my desk, I am often out at various locations, where I may have access to a microwave, but not always a fridge. The old standby of PB&J gets old quick. To be able to grab one of these meals, keep it in my work bag, and heat it up in 60 seconds… fit my hectic life perfectly. These are now on my grocery list, and a staple in my household. There are nights I get home after work/school and being out for 12 hours and I don’t want to cook a meal. I just pop one of these in the microwave, chop some lettuce, and I have dinner in no time flat. Love it! I have tried the penne pasta with tomato basil sauce and the whole grain pasta with spicy marinara. Both were full of flavor. The pasta cooked perfectly (I like mine slightly al dente) and no part of the pasta or sauce was dried out, or over cooked. 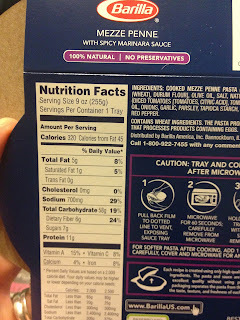 I really liked how the sauce is separate from the pasta, so that you can control the amount of sauce that goes on your meal, so if you don’t like your pasta swimming in sauce, it doesn’t have to be. In both sauces you could see chunks of tomatoes and the spices in the sauce. The flavor came through in every bite. 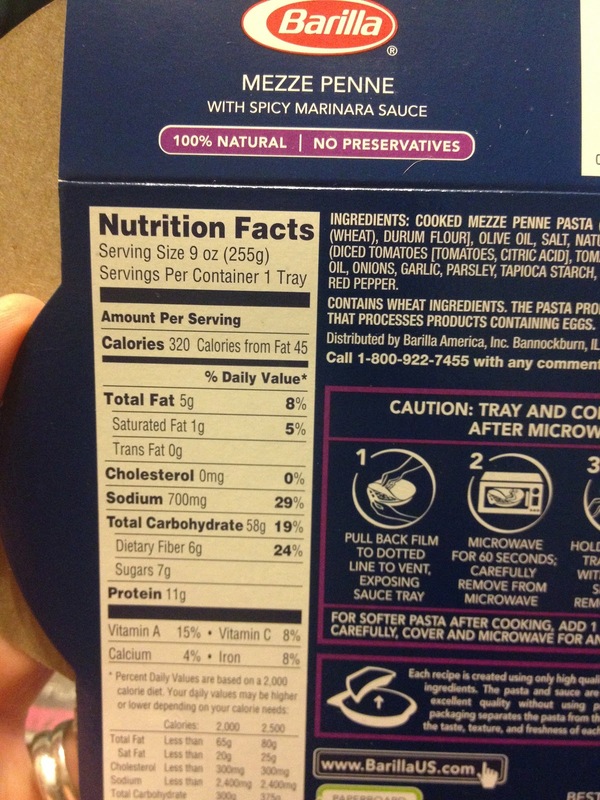 I love how the Spicy Marinara flavor had only 320 calories and 11 grams of protein! So, it’s not just an all carb meal that will leave you hungry shortly after you eat it. If the remaining products taste like these two – I will love them all! Stay tuned – I have a very fun plan for my next blog review for Barilla microwave meals. Want to read what other FitFluential Ambassadors are saying about this product – follow the Twitter Hashtag #Barillin60 – lots of great comments!